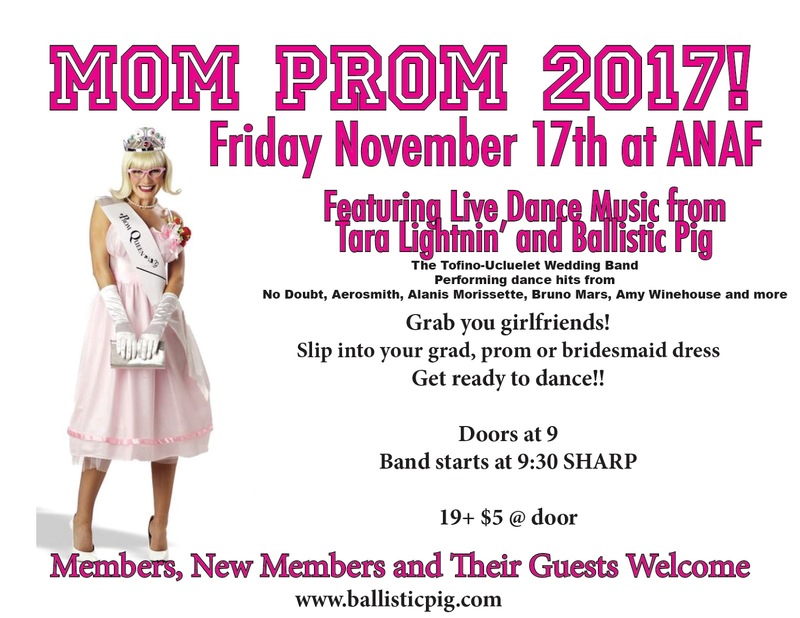 New Ballistic Pig/ Tofino Wedding Band Demo! Hi Team! We've got a great new.... the current Ballistic Pig/ Tofino Wedding Band Lineup recorded one of our gigs at The Duncan Showroom last week and I hacked it into a short demo video... Check it out, share it and let us know what you think! Hi Team, just a quick update. 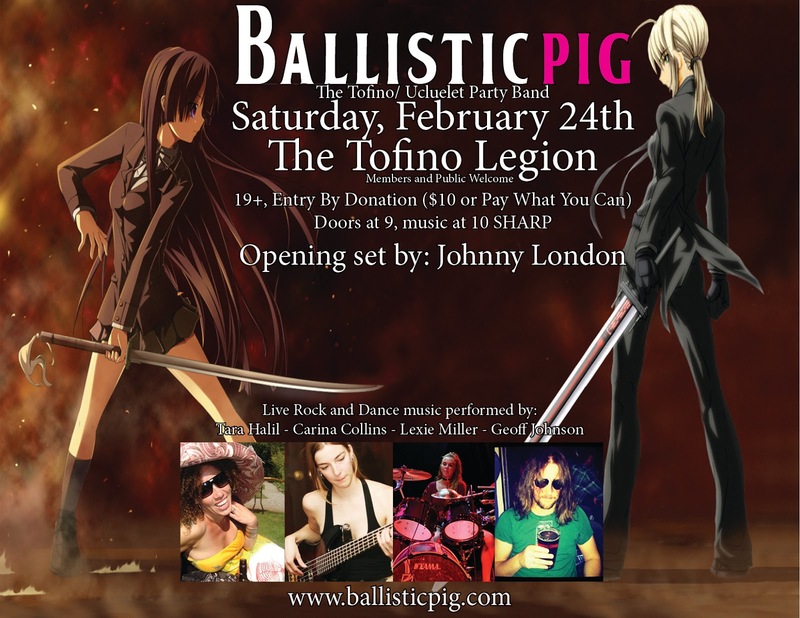 We'll be playing our first public, full band gig with our new drummer Lexie Miller on February 24th at The Tofino Legion. Hope you can make it out. Hi friends, guess it's been awhile since we updated the old website. Summer has passed and we had a great time playing events of all sorts. The full band played a ton of weddings and other great events. We even got to hit the road a bit and play some gigs in the lower mainland recently. Anyway, we're slowing down a bit now... 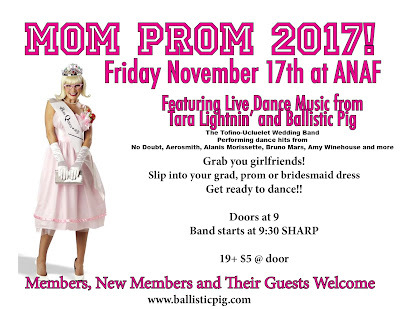 The next full band Ballistic Pig gig we have scheduled is Mom Prom at the ANAF hall in Ucluelet. Here are the details. 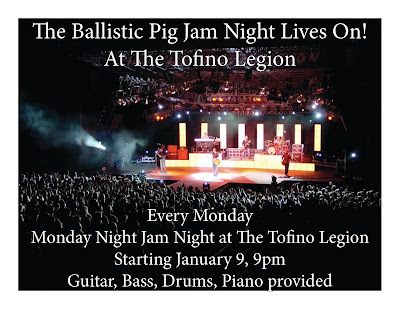 Of course Monday night jam night at The Tofino Legion continues, as does the open mic at Ukee Dogs in Ucluelet on Wednesday nights. You can also continue to catch Geoff's solo sets Wednesday afternoons at Long Beach Lodge. 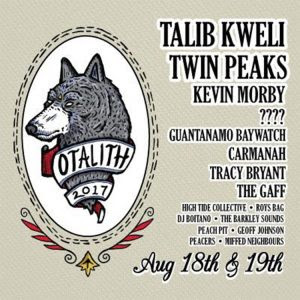 For other gigs check out the calendar to the right of every page of the website. Hopefully this winter will be fruitful with plans to add a rockabilly inspired act, a more elaborate duo set and some recording projects to the mix now that we have a little time. Stay tuned. Finally, Geoff has taken over a more active role booking events for the ANAF veteran's hall in Ucluelet, hopefully you'll come and check out one of the upcoming shows (or perform one). You can email him at ballisticpig@gmail.com if you have an idea for an event there. Of course life goes on with weddings, fun parties and other gigs including jam nights. Monday nights at The Tofino Legion and Wednesday nights at The Eagle's Nest in Ucluelet come jam out some tunes with a bunch of local talent. 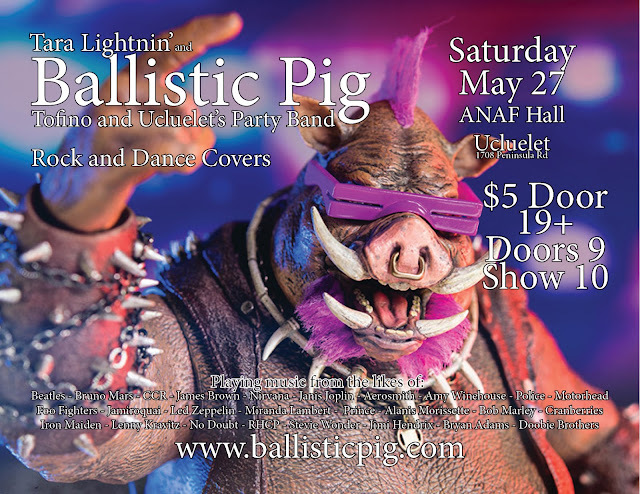 Coming up on May 27 we're playing a rare public show at the ANAF in Ucluelet. We don't break the full band out for "bar gigs" very often but thought it would be a blast to rock out for our friends before we disappear into a summer of weddings and other private event bookings. Hope you can make it! Happy New Year everyone. We spent New Year's Eve playing for the good folks at The Wickaninnish Inn. Thanks to Charles and the team for having us, we're really looking forward to the weddings we have booked there this summer it sounds like we'll be back there from NYE 2018! 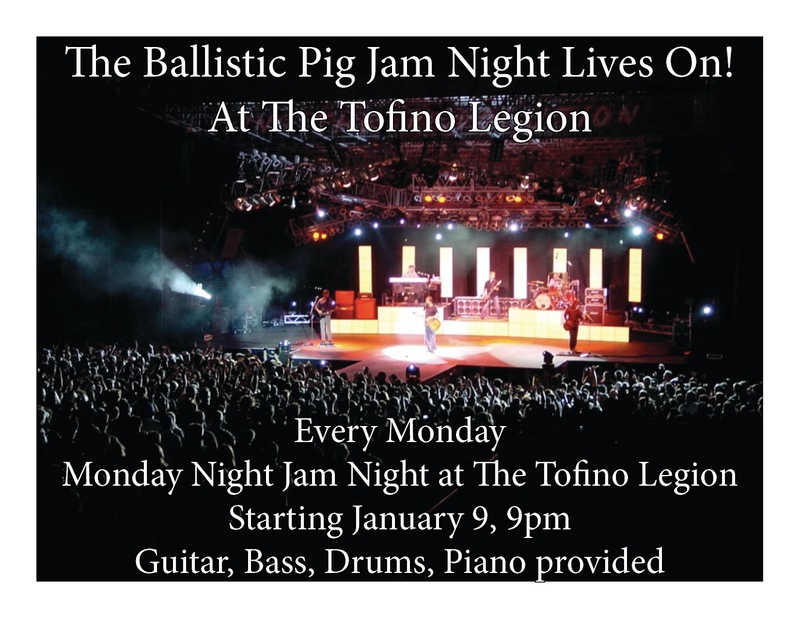 Speaking of "being back" Tofino's Monday night jam returns on Monday January 9th but is moving to The Tofino Legion while Jack's is closed for renovations. If it goes off at the new venue we may keep it there so come on out and support! We also had a great time Christmas Eve singing for the folks at Middle Beach Lodge, we had one-time Glass Tiger backup vocalist Miranda Moore to join us so she's now an honorary Pig! With that we get back into the groove of our musical life on the coast; Tara and Geoff have a duo performance at Jamie's in Tofino on the 10th and Geoff (and guests?) start regular Wednesday afternoons at Long Beach Lodge on January 11th. Every other Thursday starting January 19th Geoff will be playing at Black Rock Resort in Ucluelet, on the Thursdays he's not there other great local and Island talent will be playing. Hi folks, sorry we haven't posted for a while. Wedding gig season and moving to a new house have eaten up quite a bit of internetting time. Ballistic Pig is an entertainment nexus! Between a high energy female fronted rock band, a jazz & soul trio, a solo acoustic rock, jazz & blues set, orignal music and a one man Led Zeppelin tribute we've got every angle covered. Based in Tofino and Ucluelet we are experienced, professional musicians your guests and staff will love. Available for your party, wedding, bar, restaurant or other event. Other music and audio related services available.